MISRATA, Libya, – Libyan rebels have encircled the eastern oil hub of Brega and control parts of the town, whose capture would mark a major boost for their campaign to oust Muammar Gaddafi, a rebel spokesman said on Tuesday. The insurgents were dug in to the south and east of Brega and controlled its eastern residential area, said the spokesman. “Members of the revolutionary council saw some Gaddafi forces inside Brega but numbers are very, very low compared to the few last weeks,” he said. France said the rebels were taking over the town completely, but Tripoli denied this and the Libyan leader vowed to fight on, saying it was time to decide the battle for Libya. The rebel spokesman said he had listened to intercepted radio communications between Gaddafi loyalists in Brega which suggested they were low on food and weapons. But he played down the chances of a swift move west by the rebels, saying Brega was full of mines that needed to be dealt with before the area could be secured. “There are unconfirmed stories of mines being left under dead bodies — when our people advance they bury the dead — and also under wads of money scattered around,” he said by telephone from the eastern rebel stronghold of Benghazi. NATO helicopters attacked military convoys as they tried to supply Gaddafi’s forces, rebels said. “The Libyan resistance forces are in the process of controlling the totality of the city,” French Foreign Ministry spokesman Bernard Valero said. 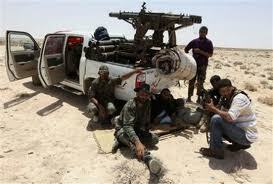 NATO said it had noticed “considerable movement” by rebel forces in the east toward Brega. “The situation in Brega is very fluid,” a spokesman said. Gaddafi vowed to fight on, in an audio recording played to a rally of tens of thousands of supporters in Al-Aziziya, 40 km (25 miles) southwest of Tripoli. “We will fight, we will defend, with men, women and children. The time has come to decide this battle through the crowds. We do not need weapons,” he said. The rally was shown on Libyan television. It was his fifth speech in 12 days and appeared designed to show he still enjoyed wide support. State television showed footage on Tuesday of Brega and broadcast what it said were interviews from the town. Fighting for Brega, which would provide access to much of Libya’s eastern oil network, occurred as it emerged that U.S. and Libyan officials had held secret face-to-face talks. Tripoli said it wanted talks with no preconditions, but a U.S. official said a clear message had been delivered at Saturday’s meeting that the only way forward was for Gaddafi to step down. France’s Valero said more Libyan envoys were touring world capitals as “panic takes over” around their leader. “When one of those comes within our range our message is always the same: Gaddafi must go,” he said..
U.N. Secretary-General Ban Ki-moon declined comment on the Libyan-U.S. meeting, but said the world body was playing a central role in moves to present terms for Gaddafi to quit. “There are many actors and the United Nations is playing a coordinating role. My special envoy is playing a central coordinating role,” Ban said in Geneva on Tuesday. His envoy Abdul Elah al-Khatib took part in an international meeting last week at which agreement was struck on a plan for Gaddafi to relinquish power and for a transition to democracy. Khatib, a former Jordanian foreign minister, was authorized to present terms for Gaddafi to leave power. Libya’s foreign minister was to meet his Russian counterpart in Moscow on Wednesday, Itar-Tass news agency said. Russian President Dmitry Medvedev, whose government has been cooler towards the rebels than the West, said compromise was still possible and supporting one side was bad for Libya. After a long stalemate in the desert on the eastern front, rebels said they had routed most of Gaddafi’s troops in Brega, which for months marked the eastern limit of his control. Brega has changed hands several times in back-and-forth fighting on the Mediterranean coast since a rebellion began in February. NATO launched air strikes in March to protect civilians from Gaddafi’s forces under a U.N. resolution. A Reuters team in the rebel-held western city of Misrata reported heavy bombardments from both sides on Tuesday. The rebels said they reached Misrata by air for the first time on Tuesday, with a flight from Benghazi which evacuated 10 badly wounded people back to the eastern stronghold. Misrata’s only link with other rebel areas had been by ship. NATO said humanitarian aid was able to reach Misrata due to its air strikes which had reduced shelling by Gaddafi’s forces. Libyan state television issued a call for men aged between 18 and 30 to join a brigade commanded by Gaddafi’s son Khamis, one of the government’s most important military units. Inducements included provision of a house.